Taken in Anza Borrego Desert. 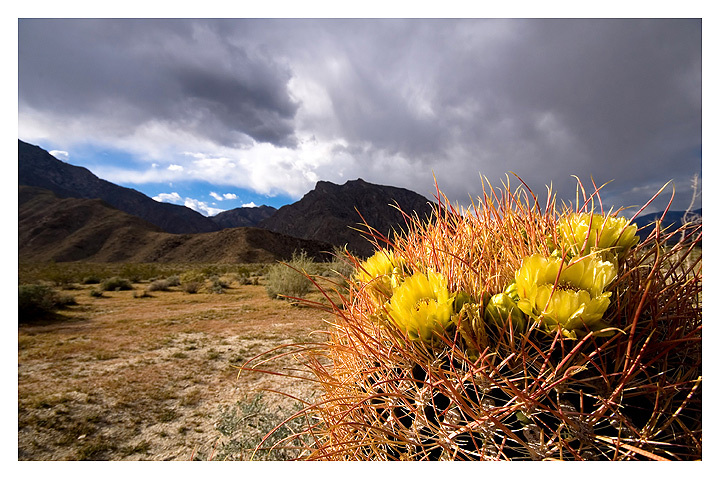 This barrel cactus was thriving in this incredibly harsh environment. Love the clarity and perspective on this shot. Well captured, extra point! I love that cactus.... We never seem to be in CA when the cactus' are blooming. It's a nice expression of beauty amongst the harshest environments. A rose amongst thorns! For flora, this certainly is a harsh environment. very nice composition. colored flowers jump out of the screen from colorless/bald hills in the background. wish those hills were a bit lighted though. really live image - nice colours and composition, well done! Proudly hosted by Sargasso Networks. Current Server Time: 04/25/2019 08:25:34 PM EDT.